BILOCCA. On February 12, at Christus Sacerdos Home, Birkirkara, Fr PELAGIUS BILOCCA, OFM, Cap., aged 86, passed away peacefully comforted by the rites of Holy Church. He leaves to mourn his loss the Capuchin Province of Malta, his brother Joseph, his brother Br Thomas of La Salle, his sister Mary Zerafa, his sister Katie Attard and her husband Paul, his brother Tony and his wife Mary, nephews and nieces and otherrelatives and friends. Mass præsente cadavere will be said today, Thursday, February 14, at 9.30am, at Holy Trinity parish church, Marsa, followed by interment at Santa Maria Addolorata Cemetery. Lord, grant him eternal rest. BONELLO. On Wednesday, February 13, at Mater Dei Hospital, JOSIE of Sliema, aged 80, comforted by the rites of Holy Church. He leaves to mourn his loss his wife Adelina, his sons Hadrian and Brian and his wife Sandra, his granddaughters Daniela and Isabella, his brothers and sisters, in-laws, other relatives and friends. The funeral leaves Mater Dei Hospital on Saturday, February 16, at 1.30pm for Balluta parish church where Mass præsente cadavere will be said at 2pm, followed by interment in the family grave at Santa Maria Addolorata Cemetery. No flowers by request but donations to Id-Dar tal-Providenza, Siġġiewi, will be appreciated. Lord, grant him eternal rest. FALZON. On February 13, at Karin Grech Rehabilitation Hospital, MARIANNA of Rabat, aged 90, comforted by the rites of Holy Church. She leaves to mourn her loss her sister Pawla, widow of Emanuel Azzopardi, her brother Joseph, her nephews and nieces Ray, Luke, Maria and Pauline, their spouses, other relatives and friends. The funeral leaves Mater Dei Hospital tomorrow, Friday, February 15, at 2.45pm, for St Paul’s parish church, Rabat, where Mass præsente cadavere will be said at 3.30pm, followed by interment in the family grave at Santa Margherita Cemetery, Rabat. No flowers by request but donations to id-Dar tal-Providenza, Siġġiewi, will be appreciated. Lord, grant her eternal rest. GALEA. 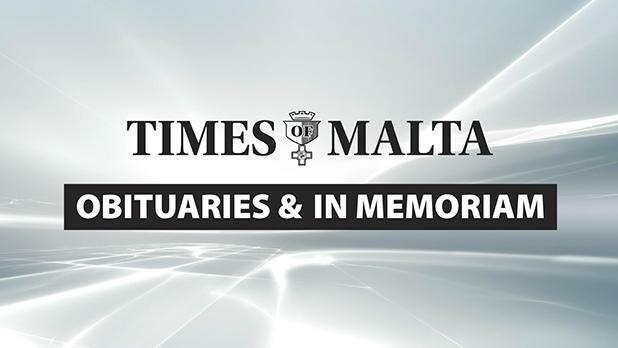 On February 14, at Zammit Clapp Home, SALVINA (Sally) of Sliema, passed away peacefully at the age of 85, comforted by the rites of Holy Church. She leaves to mourn her great loss her children Charles and his wife Carol, Josephine and her husband Ruben M. Debono, Catherine Cauchi, her grandchildren Christopher, Claire, Paul, Anne Marie, Nadine and Claudine, their respective spouses and fiancés, other relatives and friends. The funeral cortège leaves Zammit Clapp Home on Monday, February 18, at 8.30am, for Pembroke parish church, where Mass præsente cadavere will be said at 9am, followed by interment at Santa Maria Addolorata Cemetery. No flowers by request but donations to Id-Dar tal-Providenza, Siġġiewi, will be greatly appreciated. Lord, grant her eternal rest. RUGGIER. On February 13, Sr TARCISIA, passed away peacefully at the age of 94, comforted by the rites of Holy Church. She leaves to mourn her loss her brother Alfred of Canada, widower of Maria, Edgar, widower of Doreen, in-laws, nephews, nieces, other relatives and friends. Mass præsente cadavere will be celebrated on Saturday, February 16, at 9am, at Our Lady of Loreto parish church, Pietà, followed by interment at Santa Maria Addolorata Cemetery. No flowers by request but donations to the Ursuline Crèche, Sliema, will be appreciated. Lord, grant her eternal rest. AZZOPARDI – SITA, née Audibert. In loving memory of Sita on the eighth anniversary of her passing away. Always in our thoughts, her children Anthony, Carmen, Noel and Martin, in-laws, grandchildren and great-grandchildren. Lord, grant her eternal rest. FRENDO. In loving memory of MARGUERITE, today the ninth anniversary of her demise. Sadly missed by her sons Claude and his wife Maryrose, Stefan and his wife Rosalie, her daughters Marie-Celine and her husband Josie Grech, Annelise Coppini, her grandchildren and great-grandchildren. Always in our thoughts and prayers. TONNA – ĠUŻEPPI. Fondly remembered and never forgotten, especially today the 21st anniversary of his demise. A prayer is solicited. Anna, Bernardette and families. TORTELL – JOSEPHINE MARTHA, née Bianco. Many happy and everlasting memories of a beloved wife, mother, grandmother, sister and friend. Always in our thoughts and prayers. Much missed by Philip, Stephanie, John and Hugh, Gemma and Martin, in-laws, relatives and friends. Rest in peace Jo. Nigel Michael McCarthy would like to thank the Malta Sport Scholarships for financing his masters’ studies in Strength & Conditioning held at the University of St Mary’s, London, 2016-2018.